I am a long-standing numismatist with an extra interest in variations. 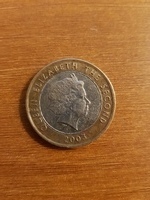 I took this coin from circulation in the UK several years ago. There were as far as I know no strikings of this coin type for this year and until the first circulation issue in 2004. The bi-metallic coin is, of course, harder for the forger to produce. They exist only in very small numbers, unconvincing as they are, and instantly recognisable in the UK circulation. nickel rim mostly apparent on the obverse. I can only think that it would be beyond the ability and necessity for a forger to accurately mirror what is a production by-product from striking rather than a design feature. This rope effect is present on other bi-metal Falkland two-pound issues before and after. It springs to mind that why would a forger go to the trouble of creating a 'foreign' coin for such a limited and distant circulation zone. The possibility is that it could have been made deliberately for deception in the rarity market. I would have thought though that there might be better and easier candidates to exercise such efforts with. It's not often that I'm in doubt about such a piece but I would value another opinion in this case; has any other example come to light for instance, etc? 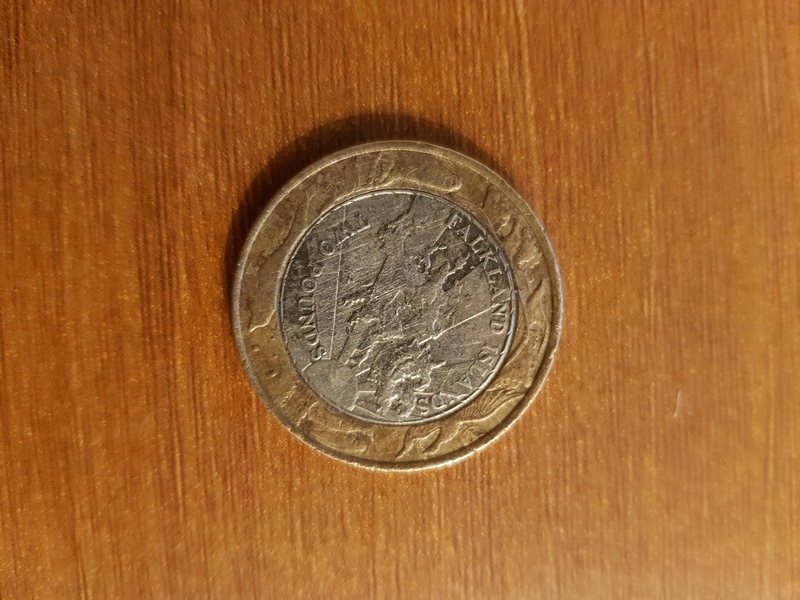 Is there a possibility that this was part of a trial strike for the mint engineers to perfect the following year's first circulation Falkland two-pound coin, and for vending machine companies to experiment with the new issue? Hi INCITATUS18 and welcome to the forum! Hello, the edge is milled only. There is no lettering. It's been a year since I posted about this rather mysterious coin. I haven't had any serious feedback on the Numista forum. A year later is a good time to update. Last July I sent the coin to The Royal Mint for verification. Their Chris Barker returned the piece with confirmation that after measuring; weighing, analysing its composition and subjecting it to x-ray fluorescence spectrometry the coin was struck at The Royal Mint. They have found in their files that a very small number of the coins were struck as part of an order from a German company called Progenio. This was to make complete sets of circulating Falkland Islands coins for the year 2003. Chris speculates that the piece was likely broken out of a set for use in circulation. There is I'm told by another RM employee an example in the RM museum. Some questions arise from this information. 1. Despite my own considerable efforts and that of several well-known dealers in the UK and America, no other example has been found or ever offered for sale. Likewise the sets; what happened to them? Why were they not put on sale as would normally be expected, or presented as gifts, and if so in what connection? 2. The commissioning company, it appears had no numismatic links and to have had a function in the finance industry. Can anyone throw further light on this? 3. To further enigmatise the coin the RM comments: ... 'its current appearance is the result of the coin's time in circulation or possibly coming into contact with an abrasive substance'. It looks to me like it has been in a fire or buried. Could it be that the sets were for some reason unknown disposed of or destroyed? It's not a pretty coin, a bit of an ugly duckling really, but it more than makes up for that in rarity and mystery, I believe it needs more research or otherwise is noted as a unique penultimate. 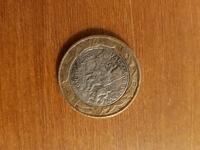 The first £2 coin with the same Radiant Sun reverse was struck as a silver proof only, in 2000. The first bi-metallic base metal Falkland Islands coin was issued as a circulating piece in 2004. This genuine 2003 example precedes that and as such should take its place in numismatic history as the first (British Protectorate)? bi-metallic £2. Out of the 103,000 Numista members, someone must know more. I have this coin. Mine is a base metal bimetallic of 1999. Coins that have been in a fire or buried would be far more destroyed. This is just probably someone deciding to clean it with a metal brush of some kind after seeing some toning. Fire damage would turn the coin irreversibly black and deformed, and burial would likely also turn it a similar color. Oklahoman; there are other bi-metallic £2 Falklands about. Yours is 1999, and the well-known millennium issue. The point is the date, this is 2003 and only the Royal Mint has the other. Arusak; well frankly anything is possible, I have seen lots of metal detecting finds of the UK version which is identical in size and composition, only the design differs. They look similar to this, particularly beach finds. As for fire damage, well point taken but it depends whether it was at the heart of the fire or recovered by someone from the edge. As for cleaning, on higher magnification, it bears none of the familiar abrasions normally seen on a crudely cleaned coin. 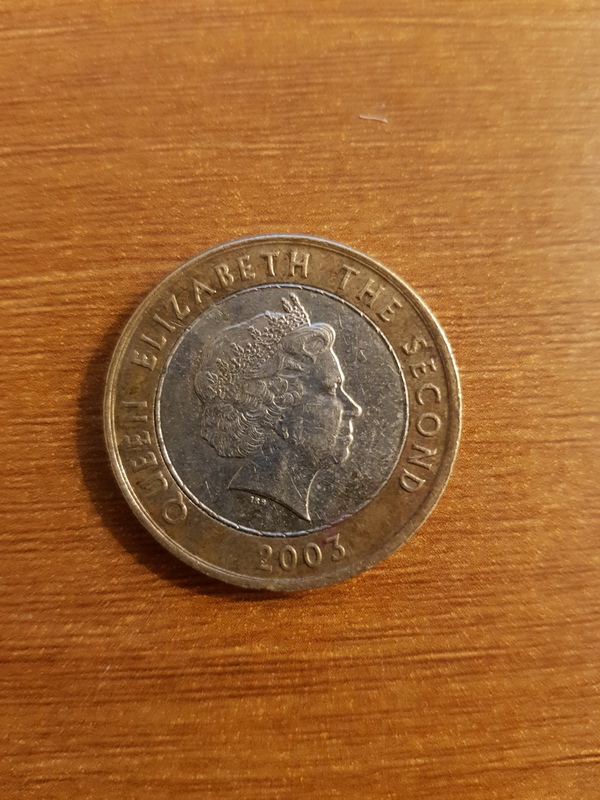 In the end, it's all speculative, I'm waiting for someone to come up with another example of the same date £2 coin or hard information for the backstory and provenance. Yes. But you claim yours is the first bimetallic. Or bimetal circulating. Not sure that's true. The 1999 is bimetal. It is in the mint set that year. And it has the radiant sun design you said first appeared on a 2000 silver. So I responded to your points. Oklahoman, hi. The 1999-2000 is bi-metallic in the sense that it's all silver. with a gilded outer ring, true. 2,500 were struck but not intended for circulation as a nickel-brass outer and cupro-nickel inner would be. 1999 brass and nickel specimens are advertised, what proportion of the total isn't known? I reckon it's still a notable coin. It seems the first truly circulating Falkland Islands £2 was dated 2004 and the same as mine except for the date and edge milling rather than the 2004 issues' lettering. I know all this is kind of dancing on a pinhead but I suppose all collectors do this more or less. We're trying to get it right, that's why I've cast this out via Numista and your input is valuable to that. I'm a collector of the ancients first, but I'm finding this really interesting in a way I never thought would happen. It seems that semantics versus numismatics are becoming the conjecture rather than the information that's needed. Last appeal: is there anybody out there that can help to clear this up? I' not asking for affirmation or confirmation that the coin is special, there is no scope for argument among those who are simply, appropriately curious. Just to clear up the questions the coin's existence raises. Perhaps I have relied too much on the received seriousness in the capacity of Numista's resource?